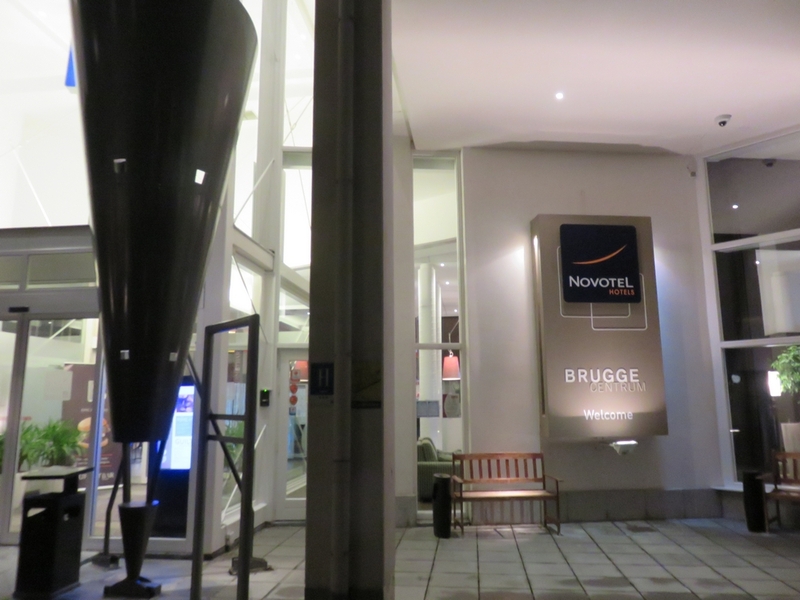 Restaurant review #69 – A couple of weeks ago, we went for dinner to the restaurant of the Novotel hotel in Bruges. Since a couple of months, most (or maybe all?) 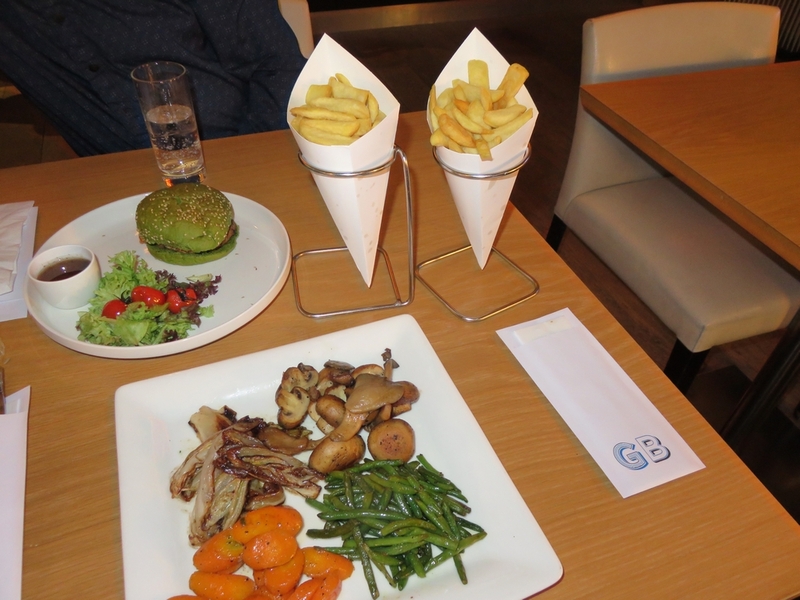 Novotel restaurants in Belgium serves the famous Dutch weedburger (no it has nothing to do with that ‘weed’, it is made from seaweeds ;-). Yeah! 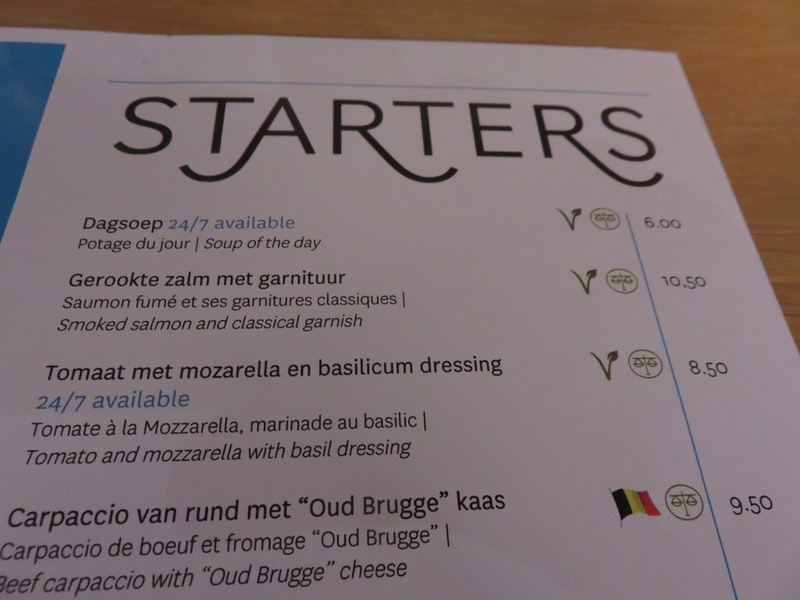 We have tasted the Dutch weedburger before on several occasions (see for example here in Texel) and are very happy that this specialty is now also available in Bruges! 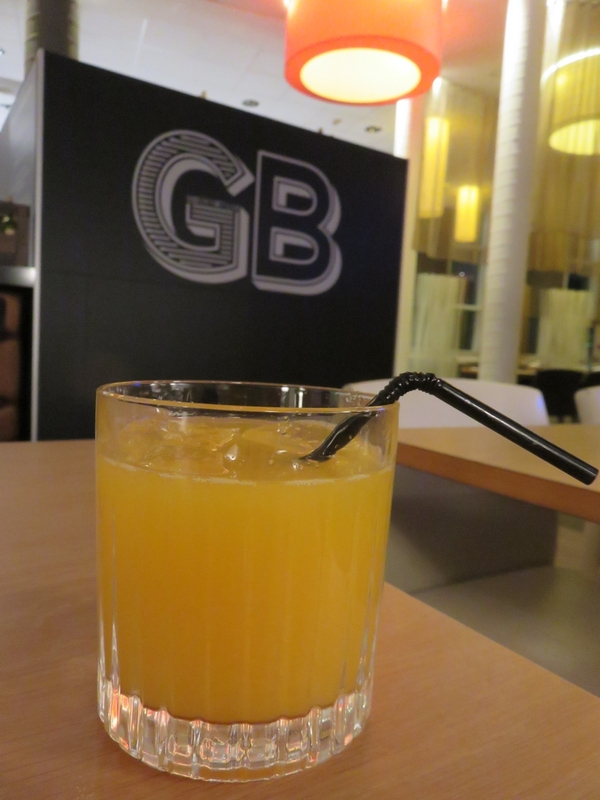 EDIT (2017): The Dutch Weedburger is no longer available at Novotel! 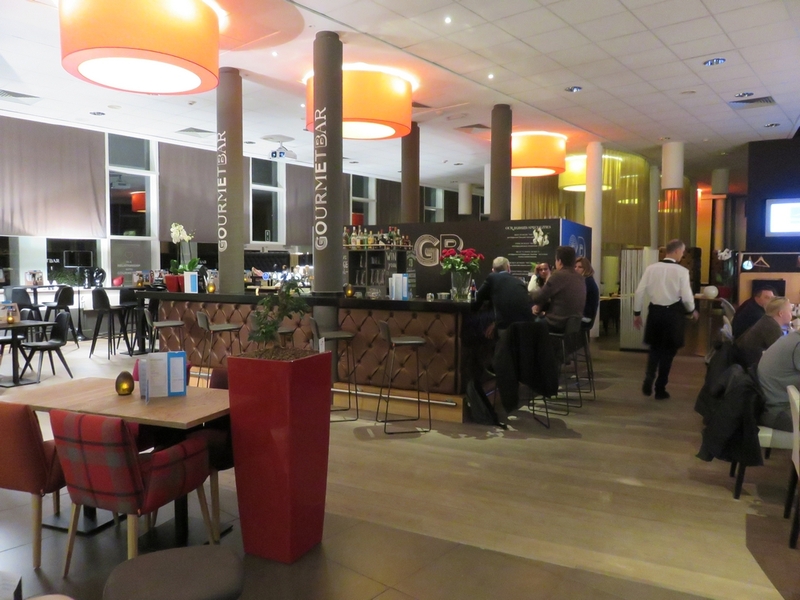 I inquired beforehand with the reception of Novotel to be sure that the Dutch Weedburger is indeed available, and if we could get a vegan menu for two (explaining what we do and don’t eat). No problem. 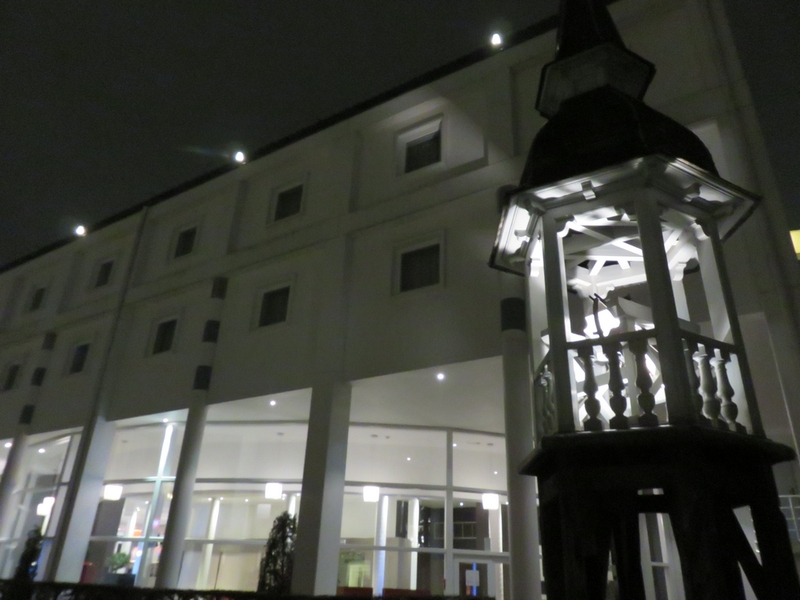 So a couple of weeks ago, we headed out to the Novotel. The restaurant is downstairs in the lobby of the hotel. 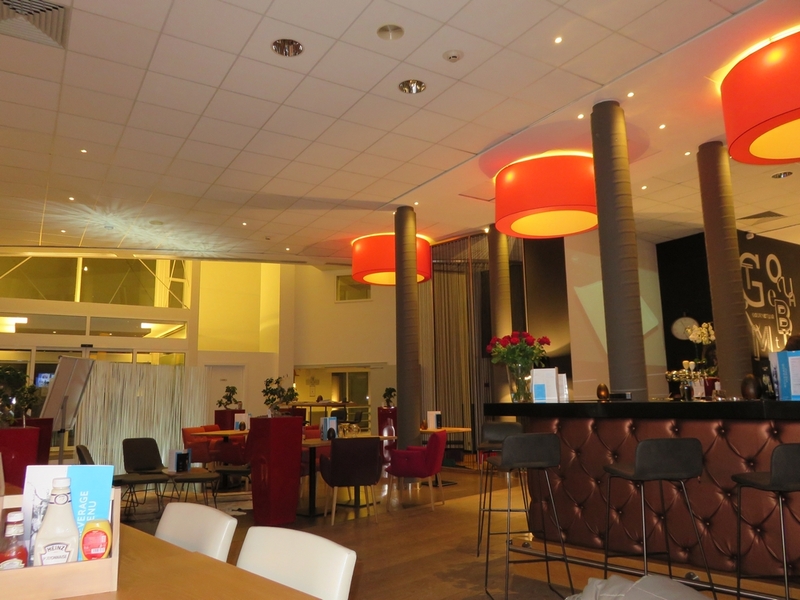 It’s a very spacious place, with the hotel bar situated in the middle. It looks very modern and stylish, but it didn’t really give us a warm nor cosy feeling. Although there were plenty of tables vacant, patrons for dinner were mostly placed in the same small section, which made it really noisy at times. 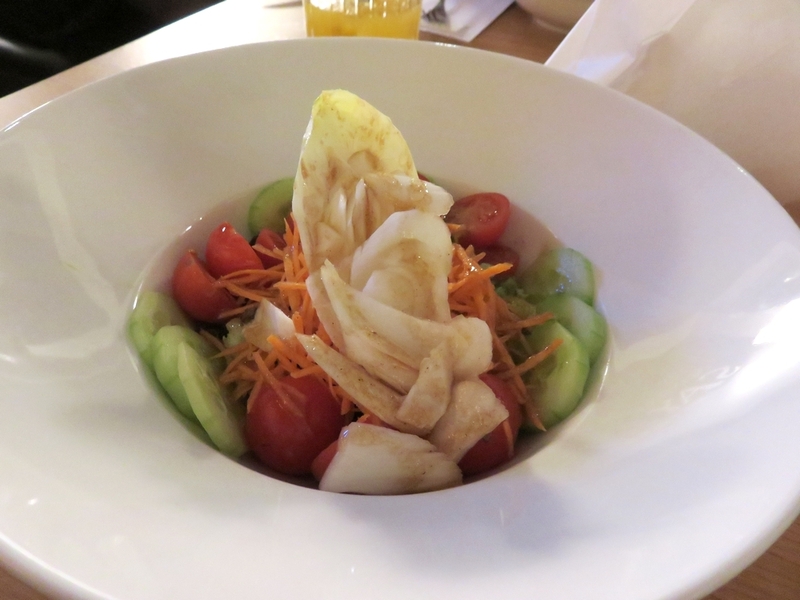 The staff was very friendly and suggested some salads as a starter (not available on the menu). The soup that day was not vegan, as it contained dairy. We ordered the Dutch weedburger as a main, and asked if one of us could try something else as a main course? 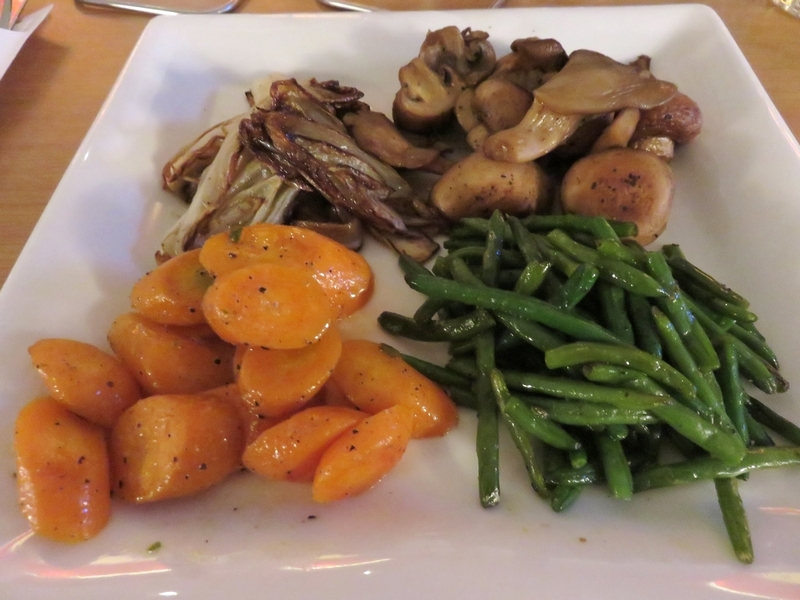 He suggested a dish with warm vegetables, and fries on the side (confirmed that they are baked in olive oil). They seemed very knowledgeable about ingredients, although our confidence was a bit tempered with seeing the salmon labelled as a ‘vegetarian’ dish on the menu card. We had two different salads. 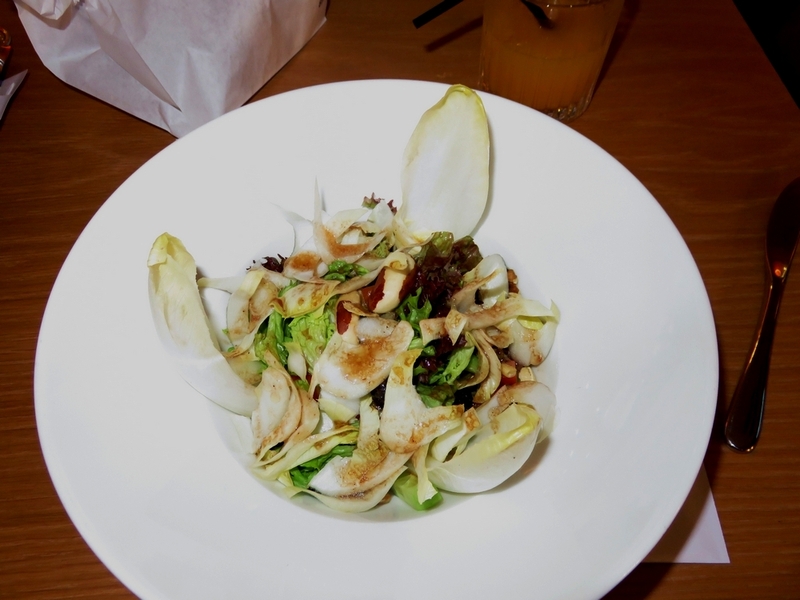 One was with a lot of nuts, and was really nice, the other was rather boring and just a mixture of raw vegetables. The Dutch weedburger unfortunatley did not come with the traditional tartar sauce, but with a sort of salad dressing. 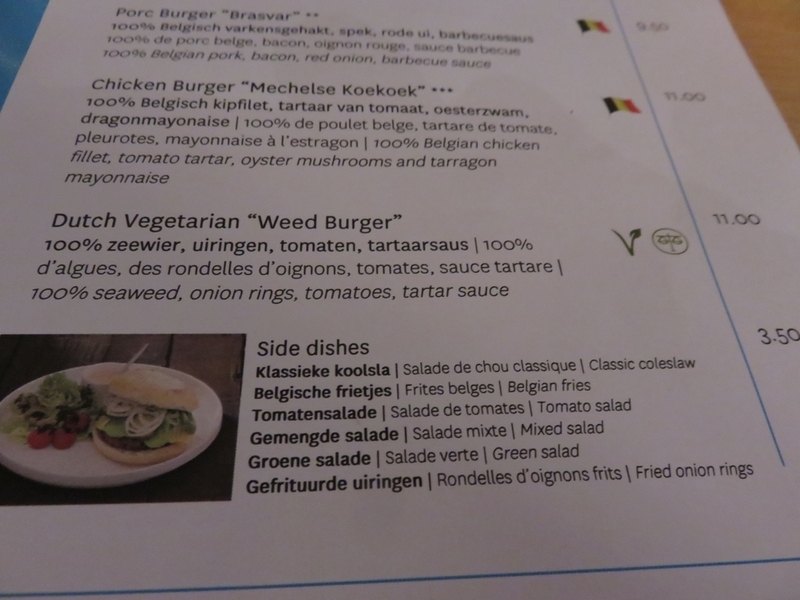 Although I think it is supposed to be served with a vegan tartar sauce, as that is part of the whole concept of the Dutch weedburger. 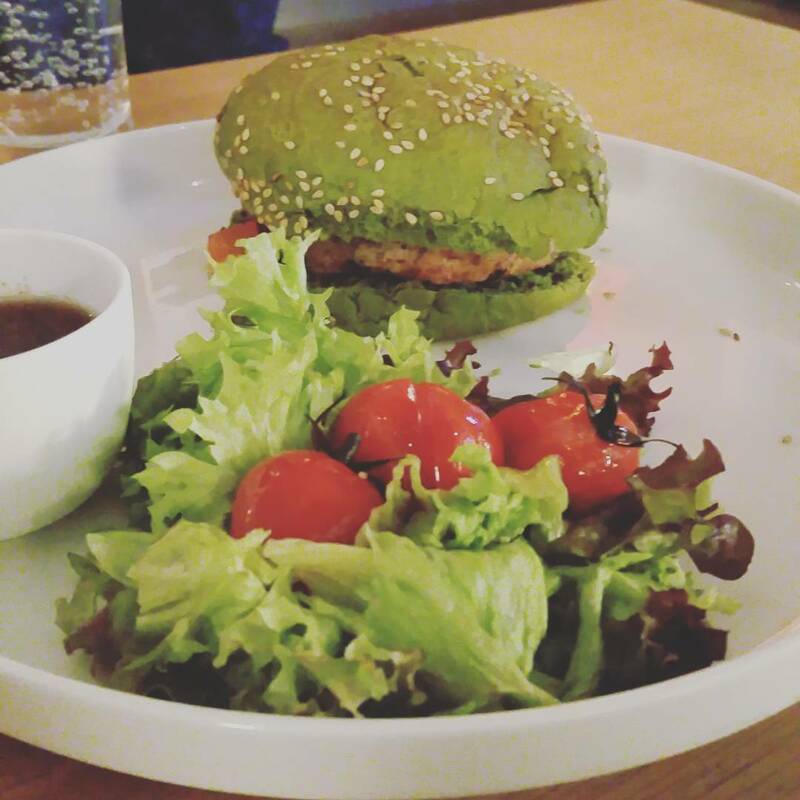 The typical green bun was very hard, and also the burger itself was baked too hard (I had some trouble getting through it with my knife). Fries were nice and served in a typical Belgian cone. The main dish with warm vegetables was just what it was, some warm vegetables, certainly not something that gives you a wow impression! We inquired about dessert and were offered a fresh fruit salad. A bit of a bummer (since we made the reservation days in advance, we were hoping they would have come up with something a bit more original). So we skipped dessert. Just a coffee (time for the coffee test!) 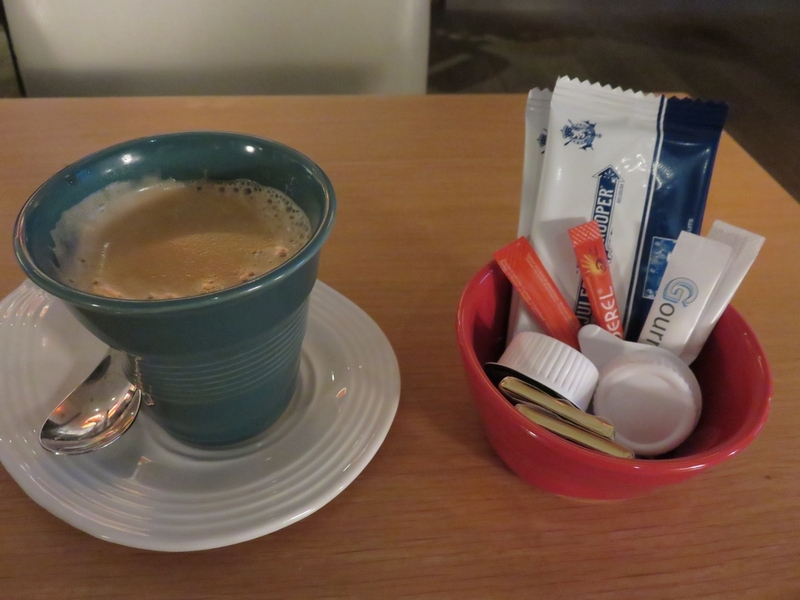 which came with the traditional non-vegan cookie and dairy milk … It’s amazing that even when having ordered a full vegan menu (and checking about ingredients), one often gets served dairy ‘on the side’ in traditional restaurants (for example also butter along with the bread). Something we hope staff will pay more attention too. 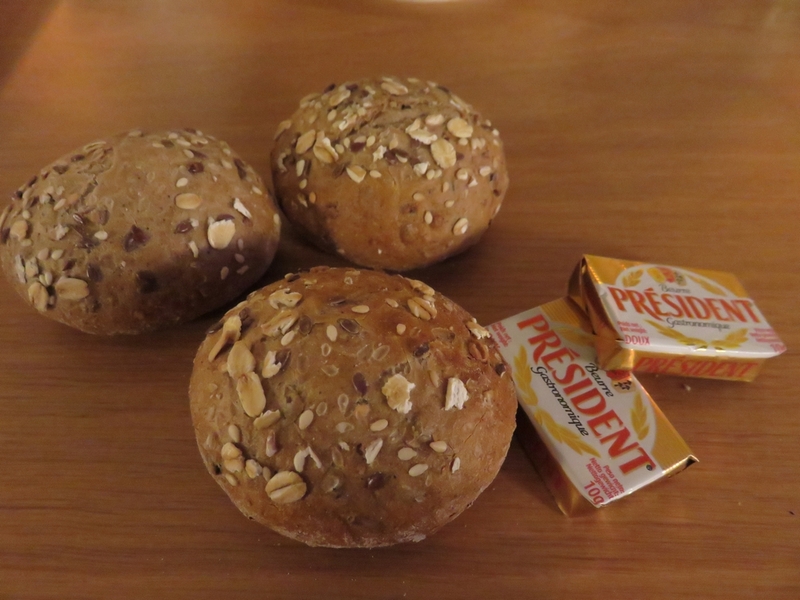 It was certainly no gastronomical experience but it is nice to have the Dutch weedburger available in Bruges (and in other Novotel branches in Belgium). As it is the only vegetarian (and vegan) offer on the menu, it did seem to be selling well. We saw several foreign tourists around us order the weedburger. I don’t think we would be heading back to Novotel restaurant again though, but sure would want to taste a weedburger again at a fair or festival, preferably with real tartar sauce! 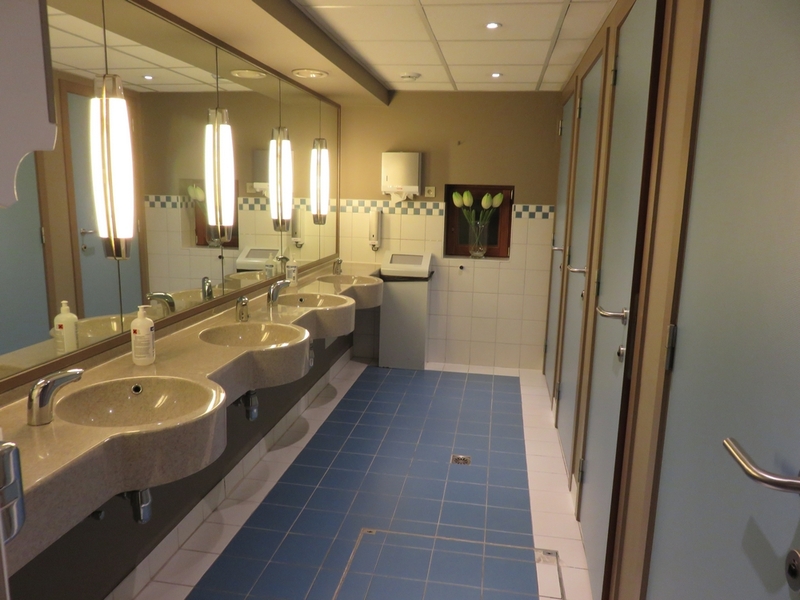 toilets at Novotel Bruges, clean, spacious (in recent reviews, I try to include a picture of the bathrooms, as it also determines the overall impression of the place). I’ve never heard of a burger made from seaweed! Unfortunate that your meals wasn’t so great though. It’s a great burger Meghan! although the seaweed taste certainly isn’t dominant. Great concept though, and good marketing with that name 😉 It’s a Dutch brand and available at a lot of fairs and festivals, and now also increasingly at restaurants. 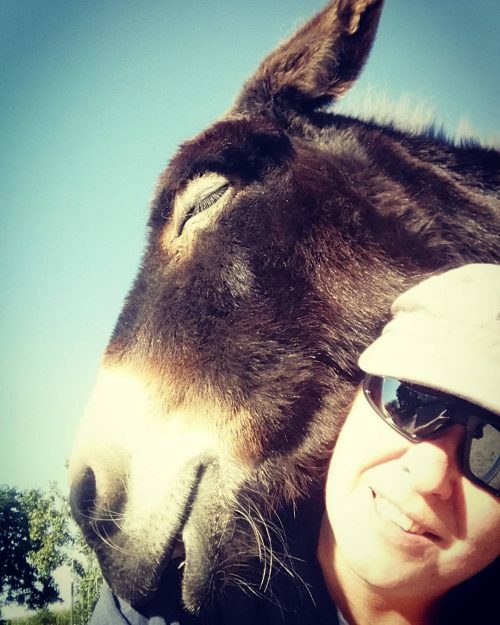 Hopelijk serveren ze hem in de toekomst alsnog met de juiste saus, en ook iets minder hard gebakken.